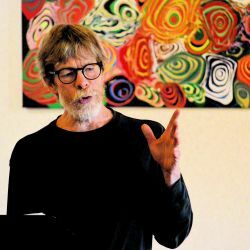 Kevin Murphy has been performing his exuberant, comic and slightly mad poetry for over 35 years. Kevin has toured throughout the Northwest and beyond as a member of the entertainment/ education extravaganza known as the New Old Time Chautauqua, and is “poet-in-residence” on Bellingham’s Chuckanut Radio Hour. He is the author of A Beautiful Chaos Demands Energy and has released two poetry CDs, Between Onions and Oxygen and The Bird of Pure Midnight. He teaches poetry workshops through the Whatcom Juvenile Justice Creative Writing Project and the Whatcom Community College Community Education program. A dramatic and engaging performer, his approach is playful and experimental. With nods to the beats, the bards, the surrealists and the blues, he often accompanies himself on guitar or percussion. He agrees with Emily Dickinson that when you encounter real poetry you feel like the top of your head is being taken off. Kevin lives in Bellingham, Washington with his wife Jeannie.